Yes, you’ve great footwear, rainwear jackets and quick-dry pants; but is that all the gear you require as a hiker or backpacker? You’ll definitely agree with us that doing an outdoor activity without adequately protecting your hands from weather elements is quite a fissure in your armor. The best backpacking gloves can help maintain our hands’ warmth in wintry conditions so you’ll be able to use them to do the chores that you need to even if the temperature is positively freezing outside. We demand lots from them, so it’s important that you spare some time to read up on them so you’d end up with backpacking gloves that are up for the challenge. They have to be warm and totally waterproof without being too cumbersome or bulky. The best backpacking gloves will efficiently keep your hands warm and dry without being so thick and heavy that you can hardly move your fingers while wearing them. So how exactly do you get the best pair of gloves? In this article, we’ll help you sort it out by providing tips on how to select the best gloves and highlighting some of the top picks in the market today. Choosing just the right glove for your needs can be an overwhelming task. With so many fabrics, brands, styles, durability levels and sizes to choose from, you’re likely to abide by the first pair you spot. However, to truly alleviate cold and optimally benefit from your outdoor adventure, you should be keen to learn about various types of backpacking gloves and mittens so as to determine which ones are the best for your activity. No time for that? Don’t worry, here are some guidelines on what to consider before your purchase. To figure out the type of glove system that will work for you, estimate the weather conditions (temperatures, the wind, downpours etc.) that you may encounter on the trail. In pursuit of your outdoor activities, you’ll experience a wide range of varying weather conditions. From intensive solar radiation to heavy downpours and cold winds. Purchasing gloves that provide adequate protection from such elements are ideal to keep your hands warm, dry and cozy. Forecasting hilly and mountainous weather condition is difficult as your estimation is based on known and unknown factors. It’s, therefore, advisable to go for waterproof and windproof pairs. Gloves with Durable Water Repellants coating, rebels Gore-Tex inserts, Gore WINDSTOPPER shells and such other water and cold resistant technologies. Nonetheless, try to answer the following questions. How easily do your hands get cold? What range of temperatures can you tolerate? How active will you be? How long will you be backpacking? Some gloves have temperature ratings which are very useful when comparing brands but until you get the necessary experience on what does and what doesn’t work, take a conservative approach i.e. purchase gloves that are warmer and more waterproof. Getting the right fit can save you hours of frustration. Remember, even different models crafted by the same manufacturer won’t necessarily have the same size, fit and shape. Here are some hints when fitting the glove. Your fingertips should just barely touch the ends of the hiking glove. You can buy a glove too big to have adequate width for your palm but ensure that it fits well around your fingertips such that you can fasten your snowboard bindings with them on. If on fitting your fingertips, your palm can’t fit or vice versa, it’s time to look for another pair. You should be in a position to push down between index finger and thumb or between your middle finger and index finger without excessive inward pressure on the appendages. If they’re excessively pressured inward, it generally means that the glove is too small and you should consider another pair. Also, consider the material. Leather gloves require some break-in time; it’s normal for them to feel stiff at first. Most goatskin leather pairs should feel comfortable once they soften up significantly and stretch noticeably in 2-4 days. In addition, consider the glove’s coverage. Does it cover up to or past the wrist? This selection is mainly based on your activity. For example, when skiing, gloves covering your hand past the wrist are ideal to keep the snow out while a small glove up to the wrist can be handy if you’re actively using your hands on a frosty day. Not in a position to fit the glove before purchase? You should send your hand measurements to your seller for a convenient pick. Measure the circumference of your hand around the knuckles excluding your thumb. Then, measure the length from your palm’s base to the tip of middle finger. Use the larger of the two dimension to select a glove size. Hiking gloves make use of synthetic fill insulation, traditional wool, fleece insulation or a combination of the two. While some are warmer and more efficient than others for a given weight, it’s mainly a game of insulation volumes. According to our experts, PrimaLoft is the highest performing and warmest by weight. It’s followed by EnduroLoft which compared to PrimaLoft is not quite as quick drying nor as warm. Other remarkable insulations include Quallo Fill, Micro Temp, and Thermal Q. Remember, most manufacturers label the amount of insulation when it comes to warmth levels. It’s more important than the type of insulation, thus select accordingly. In the fleece department, garment gurus recommend Hi-Tec Polartec Wind Pro fleece. It’s denser, durable and warmer than any other fleece in the market. When the two (fleece and synthetic insulation) are used in combination, the resulting gear warms up quickly. As with synthetics, manufacturers label the weight (100 g, 150 g etc.) of wool/fleece they add in the gloves. With this in mind, just select accordingly based on your needs. This refers to the capability of performing tasks with your hands. It’s mainly influenced by the stretch of glove materials and their fitting. Purchasing less dexterous gloves means you’ll have to keep taking them off more often. This will not only leave you frustrated but your hands won’t be as warm also. A common tradeoff for most models is that warmth comes at the expense of dexterity and if you’re interested in retaining both features; you’ve to pay more. Can you write with your gloves on? Buckle your ski boots? Tie running shoes? Or unlock a car door using average-sized keys? Select dexterous gloves based on your planned activities. Gloves are normally misused. They’re rubbed against rough rocks, thorny twigs, rough ice climbing ropes etc. Nonetheless, their longevity isn’t just the duration till they fade, have a hole on their surface but also how long the stitching holds up, waterproofing last, etc. Experts recommend pairs with goatskin leather palms rather than synthetic palms as they hold up much better. Your glove material matters. You should consider if you require a leather glove for abrasion resistance, a string-knit pair for cut resistance etc. For string knit gloves go for TenActiv and Kevlar materials. TenActiv keeps the hand cool, it’s lint-free, good for handling food and is easily cleaned. Kevlar on its side has heat-resistant and cut-resistant properties, it’s great for sparks and rarely melts when in contact with open flame. Palm materials are vital too. Experts recommend goatskin leather. Though expensive, it’s durable and supple. Backpacking gloves come in a number of style varieties. Double-layered gloves have an outer shell and a separate, removable inner liner. They are warmer and dry quicker when compared to single pairs. Single-layered gloves combine the shell and the insulation in one piece. They’re more dexterous and easier to take off and on. Gauntlet gloves contain adequate fabric that extends beyond your jacket’s cuff. The style is easy to get on and warmer as there’s no restriction in terms of insulation volume. However, in wet conditions and snowstorms; water can run down your rainwear into your glove. Undercuff styles overcome this limitation as they go under your jacket’s sleeve. However, they take a little more work to get them on. With this in mind, you should select a glove that best suits your needs. And in selecting the glove that best suits your needs, you should also consider the extra features that it has. Technological advancements have impacted glove innovation positively. A glove that offers unique benefits should be your ideal choice. For example, some gloves are touchscreen compatible which allows you to operate your smartphones without having to take them off. Others come with liner gloves for added warmth while some pairs have features such as anti-impact padding, arc flash protection, vibration dampening palms, cut-resistance etc. Whether you’re planning on snowboarding, snowmobiling, backpacking, alpine climbing, skiing, driving, trekking, camping etc., there’s a glove out there for you. Are you open to recommendations? Here are some reviews of the top-rated pairs in the market today. They’re our experts’ top picks and thus worth your time and money. Description: Imagine how depressing it is walking along a waterfront with the temperature as low as 30 degrees. You try to reach out to your friends but can’t, your hands are too cold. Well, Outdoor Research Pl 400 Sensor Gloves offer solutions to such scenarios. With an adequate amount of fleece insulation and wind protection, you don’t have to pocket your hands while strutting around town. The spandex fabric ensures that the glove is stretchable making it more dexterous. The glove is also very light and quite thin for the warmth that it offers, so you’ll be able to have more freedom with fingers and hand movements while having this glove on. Some customers complain that the touch-screen compatible material is very fragile. Nonetheless, this sensor glove is designed to take on any trail during a cool-weather hike. In addition, the lightweight polyester fabric is waterproof, dries quickly and is extremely breathable which keep your hands warm, dry and comfortable. While hiking the trail, just slip on this glove and save your day. Just make sure to pick a bigger size than you usually would because this glove runs small. Related: Once you’ve got your hands protected, the next thing you need to do is make sure that the top of your head is protected too, so heat would not escape from it. You can do that by wearing this Outdoor Research Wind Pro Hat. 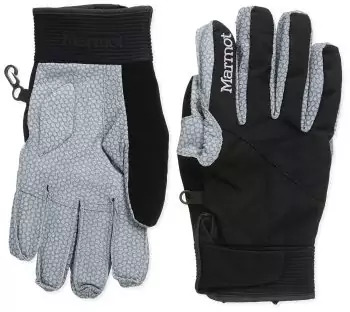 Description: This pair of Marmot 16260 Men’s XT Glove is perfect for the price. Its under-cuff design prevents any water running on the jacket from getting into the glove keeping you dry. The MemBrain membrane, waterproof/breathable stretch fabric and wicking lining combine to keep your hands dry in wet conditions. Rmax-100 insulation in conjunction with the high-loft fleece lining keeps you warm regardless of the prevailing weather condition. The leather reinforcement and Falcon grip pad are resistant to abrasion boosting the gloves durability while reducing impact effects. In addition, the free-flow stretch fabric results in a more dexterous glove for swift manipulations. Planning for a Vickery Creek trail to Roswell Mill? Marmot XT glove got you covered. On the flip side, you should note that this glove is quite thick. That thickness is due to its high-capacity Synthetic Thermal R Max insulation system. It’s great for keeping your hands warm, but it limits dexterity. The free-flow fabric makes it so you won’t have to take this glove off for every little task, but you may still need to do so occasionally. Related: There are an array of winter activities you can wear these glove to do, but if it involves walking on snow, you should also be sure to equip yourself with this MSR Lightning Ascent Snowshoe. It will make the trip much easier for you. Description: Much as their cuff are narrower than expected to make them difficult to put on, these Black Diamond Men’s Legend Gloves are the queen of all trail in cold countries. These under-the-cuff freeride pairs with legend’s premium materials are designed to repel anything a rugged trail can dish out. Full goat-leather shell, goat leather palm, and compression-molded padding ensure your hands are protected from excessive impact and abrasions. 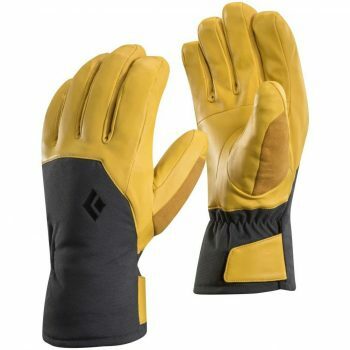 In addition, Kevlar stitching improves the gloves water, cut and heat resistance boosting its durability. Whatever wilderness activity you put your mind into, Black Diamond got you covered. 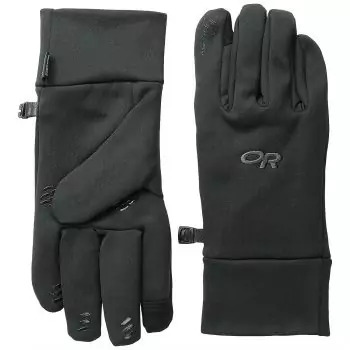 Their plus warm technology and PrimaLoft insulation lining keep your hands warm throughout the trail while all-weather construction and Gore-Tex inserts combine to protect your hands from wind and wetness. These gloves look thick but are actually quite tight around the hand—especially around the cuff because of its narrow design—so you might want to go one size larger than you usually would when you purchase them. 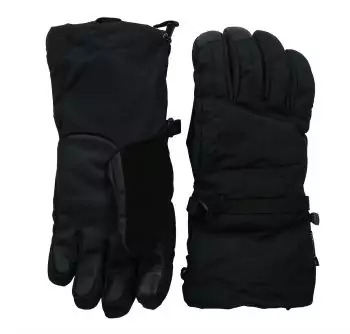 Related: These gloves are perfect for any kind of winter activities but are specially designed for challenging ones that require a high level of dexterity and durability. For such difficult courses, you should make sure to come equipped with enough water so you can keep yourself hydrated while you focus on the task at hand. This Hydro Flask Double Wall Water Bottle should do the job nicely. Description: This unisex North Face Triclimate Etip Glove is a 5-dimensional fit for a personalized fitting. This fitting ensures that the gloves you end up with are the perfect ones for your size. Its touch-screen compatible fabric allows you to use your smart electrical devices without taking off the glove. The FlashDry liners wick moisture keeping your hands dry. The liners are stretchable too which result in a versatile glove. The wrist oven leash in combination with a hand warmer keeps you warm on a frosty day while the radiometric articulation help retains the hands in a natural relaxed position. Moreover, full-coverage gauntlet keep snow out in icy conditions. What’s more? You get all this at an affordable price. With these gloves on, you should be able to do all the work that you need to without having to take them off even once all day. These gloves are not just suitable for both men and women, but can also be worn by children. Related: This glove is enough to keep your hands—which is where most of your body heat escapes from—warm all day, so it’s got the basics covered. But if you tend to run cold and not even high-necked jackets and high-quality gloves are enough to keep the cold away, you should wrap this North Face Classic Wool Scarf around your neck on top of everything else. Description: Outdoor Research Luminary Sensor Gloves are crafted to meet the needs of alpine climbers. Inspired by Medieval gauntlets, this 3-in-1 backcountry men’s pair excels at dexterity alongside shielding you from the brutal weather. The leather palm outlays and a 100% goat-leather palm protect your hand from excessive impact effects while boosting the glove’s durability. The tapered wrist and super-clinch gauntlet closure make it easy to put on the pair. Gore shell, the wind, and waterproof fabric result in a dry and cozy glove while the wool liners and luminary sensor keep your hand warm all day. The fabric is quick to dry, making it ideal for multiday endeavors. You can dry your pair overnight in preparation for an active morning. In addition, the material is touch-screen compatible and thus you can reach out to friends and family as you follow the East Palisades trail at the Chattahoochee River. 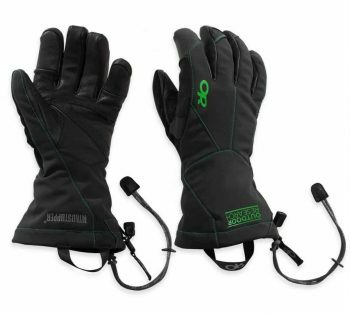 These are the perfect pair of gloves to wear to a place where the temperature is around the range of 10-30 °F. Related: As this glove is designed to handle really cold places where the snow really piles up high, it’s really important for you to wear the appropriate footwear. Generally, snowshoes should suffice, but if you need something else that would allow you to move around faster this Kahtoola MICROspikes Footwear Traction will do the trick. 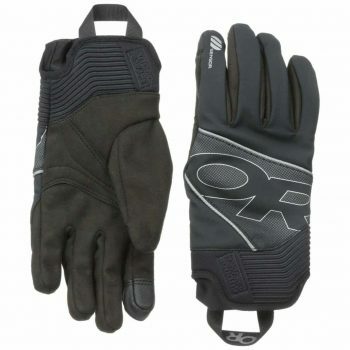 Description: The Outdoor Research Afterburner Gloves are the best-valued gloves among under cuff models. They provide full coverage of your hands, keeping you warm and comfortable. The stretchy nylon fabric, water-resistant suede, under cuff design and molded neoprene cuffs combine to repel moisture off your hands while enhancing breathability. Fleece lining with the Endural loft insulation keeps you warm through Nordic skiing outings. The glove offers excellent dexterity for any manipulation while the touchscreen-sensitive index finger allows you to use your smartphone with the glove on. In addition, the leather palm with Lycra gussets protects your hands from excessive vibrations/impacts. What’s more? You get to enjoy all these benefits at an affordable price. It’s quite versatile and can be your go-to glove for a good number of winter activities as long as the temperature does not go any lower than 20 °F. Although when purchasing this glove, it is recommended that you buy it one size smaller than you usually would because it runs big. If you choose the wrong fit, the extra space bubble might reduce the warmth that this glove offers. Related: Don’t just focus on keeping your hands warm. Your legs also need some warm loving because heat escapes through these extremities really rapidly. Wear these Outdoor Research Crocodile Gaiter whenever you have to venture out during the colder months. There you have it! A review of the top-rated backpacking gloves. With this, you’re bound to find a pair that suits your needs. If not, you will have a clear guideline on how to choose the best glove for your outdoors. In conclusion, remember that going outdoors without protecting your hands from weather elements is a big no-no. Much as gloves provide the necessary shielding, you can’t completely battle the cold by purchasing any pair that you spot. A good glove should keep your hands warm, dry and cozy with little weight. Battling the cold for a fun outdoor adventure is the real deal. So you can do this reliably, consider the points outlined above and be sure to acquire a glove that’s just the perfect pair of hiking the mountain trail comfortably. Which is your favorite backpacking glove? Why is it your ideal choice? Are there any other backpacking gloves that you think should be on this list? Add your explanation on the comment section below.